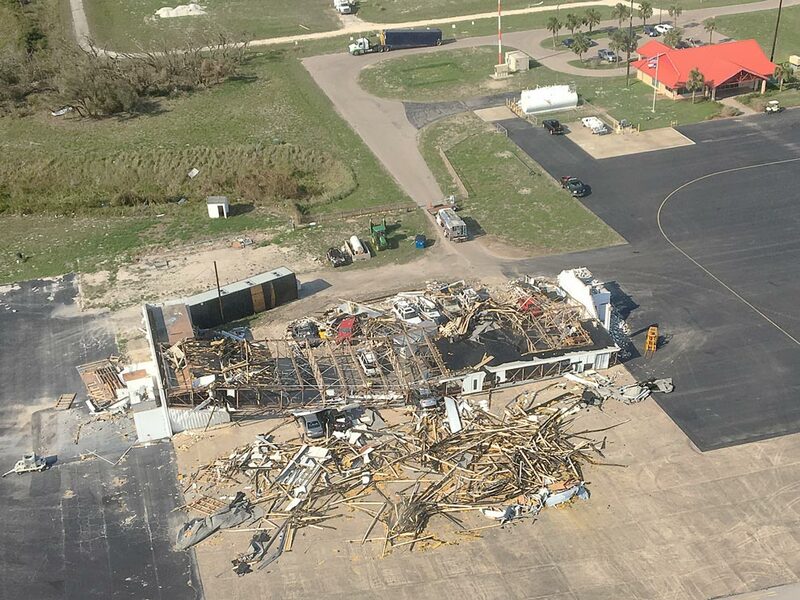 Rockport, Texas was in the direct path of Hurricane Harvey that wreaked havoc on the Aransas County Airport. 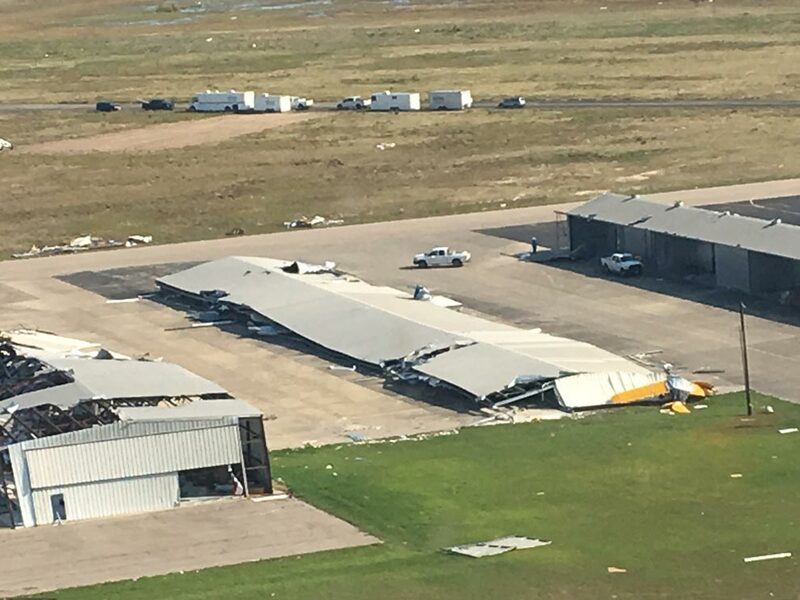 All the hangars still standing had Schweiss bifold liftstrap doors, those that were destroyed did not. Occasionally people comment on the fact that Schweiss hydraulic and bifold doors may be built heavier duty than needed. 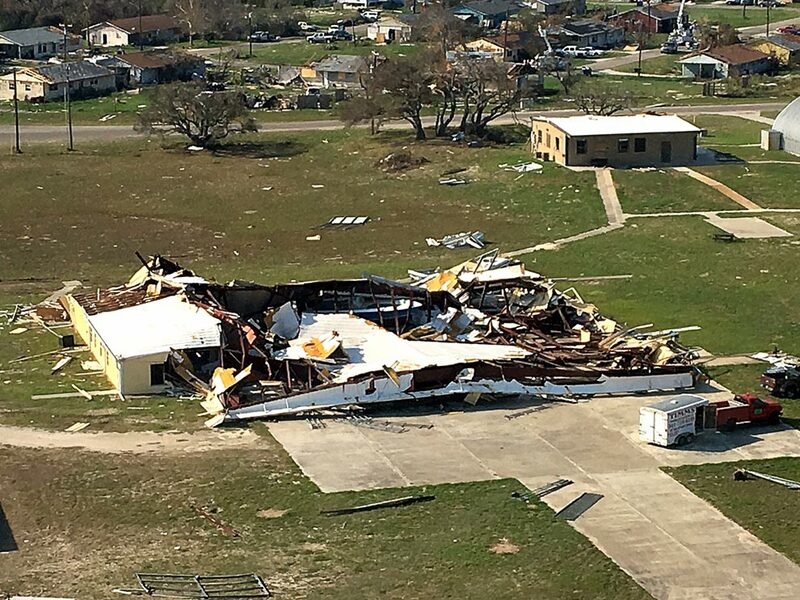 You won't get that comment from pilots occupying hangars at the Aransas County Airport in Rockport, Texas. The small seaside town of Rockport is located 30 miles north of Corpus Christi and the neighboring city of Fulton bore the brunt of Category 4 Hurricane Harvey that wreaked havoc through Texas coastal towns August 25. Harvey had sustained winds at Rockport in excess of 145 mph for a period of 5 hours with wind gusts over 160 mph. 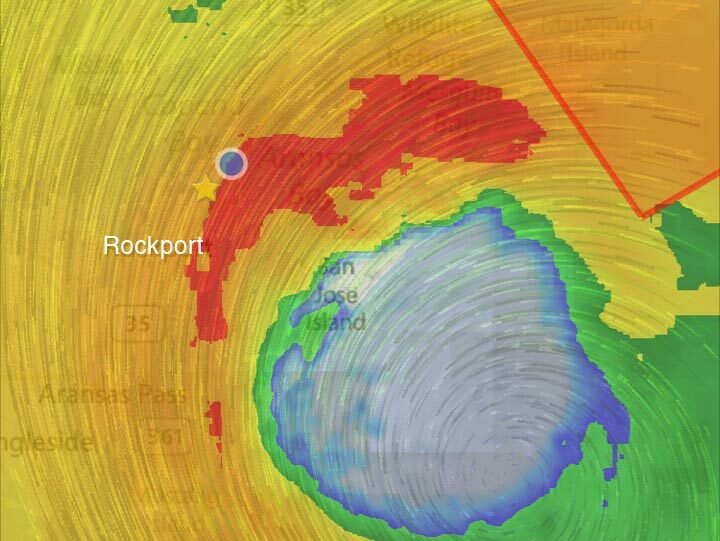 Rockport experienced hurricane-force winds for over 13 hours total. 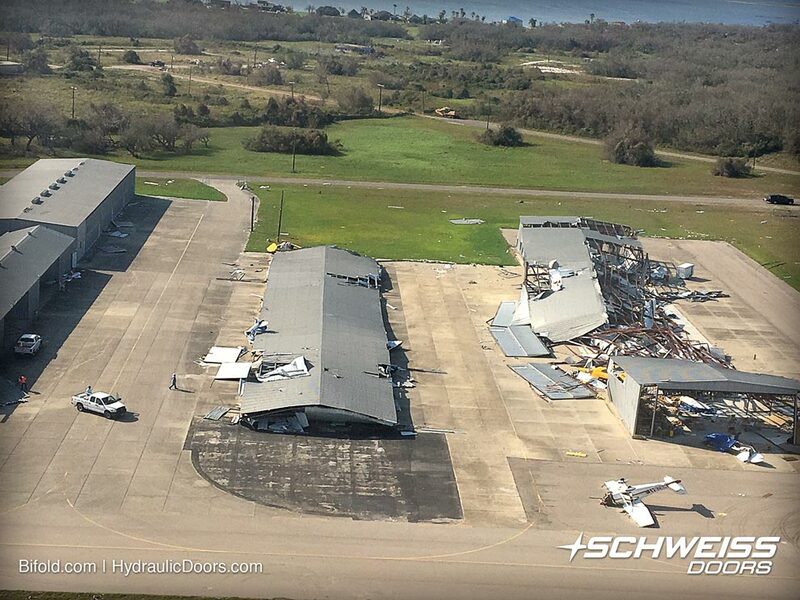 Airport Manager, Mike Geer, was so excited to see that in the aftermath of destruction the hangars at his airport with Schweiss bifold doors on them were still standing that he gave Mike Schweiss a call to pass on his praise. "Those doors in large part are why we have buildings here that are still standing. We lost seven buildings all together for a total of about 90,000 sq. ft. of hangar space. I believe the Schweiss doors are why the buildings that are still standing are still up. On everything thing else we lost the doors and the buildings followed right after. When we rebuild, I guarantee you we will be putting Schweiss doors on these hangars," said Geer. There are a number of Schweiss bifold doors at Aransas County Airport. Two of the largest bifold liftstrap doors on box hangars are 60' x 17' and eight 43' x 14.10' bifold doors went on the T-Hangars. All these liftstrap doors are windrated at 130 mph and include hurricane pins to further secure them to the hangars. "We have eight bifold doors on T-hangars and that hangar is still standing and every door stayed intact. We have another identical hangar next to it that had one of your competitor's doors on it. 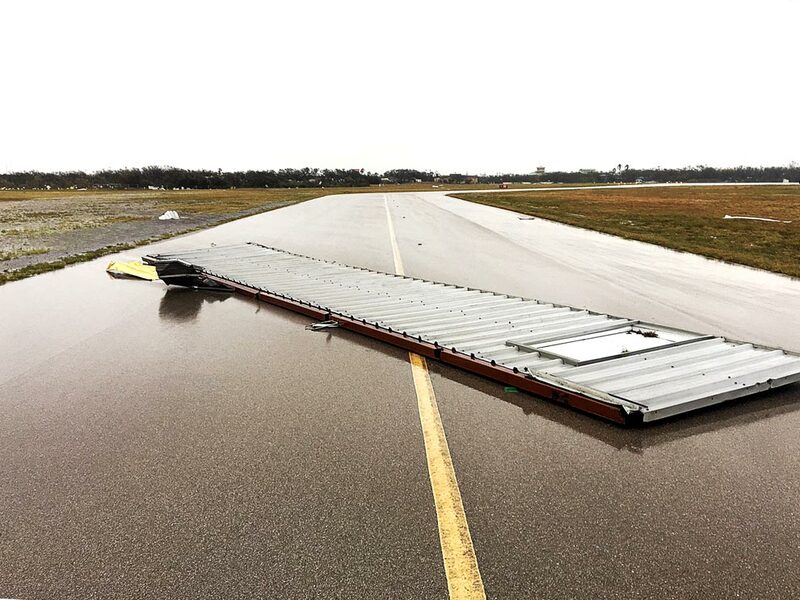 That hangar was picked up and thrown to the ground because the doors failed. Our T-hangars that survived were the biggest deal to me. They took a full frontal and then a full force again after the eye crossed over; they got hammered. They have some cosmetic damage, but the amazing thing to me was that the doors held. The hurricane pin bolts (windpins) were bent 25 degrees; they are an inch thick; that tells you how strong that wind was, but the Schweiss doors took it," said Geer. 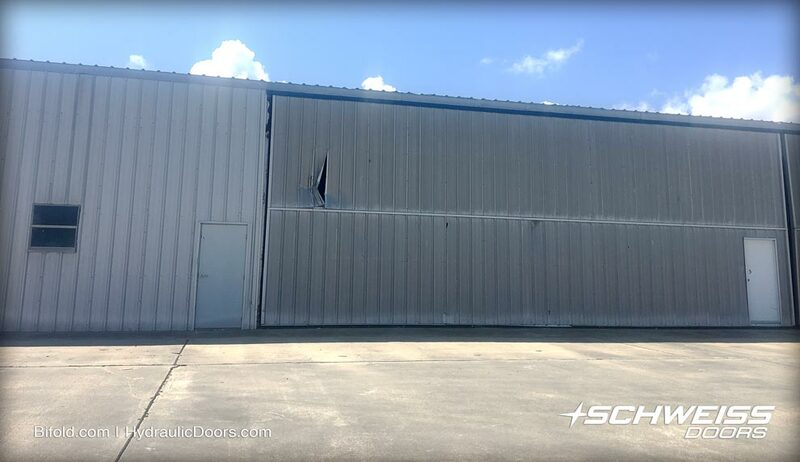 These three large box hangars with Schweiss 60' x 17' bifold liftstrap doors look like they were totally missed by Hurricane Harvey, but they weren't. On the large box hangars, Geer said one wingnut came off on a plexiglass window. The exterior cladding stayed intact. All told 22 planes at the airport were damaged and 15 more destroyed. Geer said they even had engineering students from different universities here studying the impact of the wind and all of them said: "The doors were the reason your T-hangars survived," noted Geer. The 7,000 sq. ft. hangars with the 60 ft. doors are 35' high. All the hangars there are built to at least handle a Beechcraft King Air 350 and all are built for more than that. Geer said one of the doors had a backup system and to open one of the others after the power outage they wired a generator into it to operated it that way. More than 2,300,000 customers across Texas were still without electricity as Harvey threatened to stall, setting up for several days of rainfall that tallied up to 50 inches in some spots, and about 15 inches in Rockport. Hurricane Harvey, the first major hurricane to make landfall in the United States in more than a decade, made landfall on the Texas coast late Friday as a Category 4 storm, destroying homes, overturning vehicles and sinking boats, severing power lines, and forcing tens of thousands of residents to flee. When Harvey was later downgraded to a tropical storm, it lingered over Texas as record amounts of rain were predicted, spawning even more destruction in the form of catastrophic flooding. Catastrophe modeling companies have estimated the insured damage caused by Harvey and Hurricane Irma that ripped through Florida at $50 to $70 billion. "I chose to ride out the hurricane in the airport terminal for several reasons. One of which was that I knew it would be very difficult to get back into Rockport after the storm passed. I believed that the airport would be a natural staging ground for the relief and recovery efforts so my thought process was to be ready to help with the first responders. Had I known Harvey was going to intensify into a major hurricane, I would have evacuated. Half of another manufacturers bifold door went for a ride on a 160 mph wind gust. "It was like having a 747 with parking brakes on at full throttle just outside the door. It was incredibly loud. We had hurricane force winds here for 13 hours. The Category 4 part sat on us for five hours - that's never happened before, most hurricanes move through in three to five hours - this hurricane sat on us for quite awhile, it didn't stall in speed, it stalled in forward momentum. The wind came directly out of the north for two hours and then directly out of the south for two hours, we were right in the middle of the hurricane, in fact it took the eye over an hour to pass over. I have learned since that there were multiple F-5 tornadoes inside the eyewall," explained Geer. In the aftermath of the hurricane, bucket and equipment trucks at the airport were present for days and weeks. At one point they stretched over four miles and were parked bumper-to-bumper. Hurricane Harvey was the first Category 4 storm in the U.S. since 2004 when Charley menaced Florida; Texas had not endured such a powerful hurricane since Carla in 1961. The Category 4 hurricane had a diameter of 280 miles. Two estimates put total losses at as much as $75 billion. An estimated 30,000 people needed temporary shelter. The Aransas County Airport is located on SH 35 North, 4.5 miles from downtown Rockport and bordering Fulton. There are two lighted runways, lighted taxiways and other facilities at the airport as well as future sites for development. The longest runway at RKP (14-32) is 5,600 ft. long and 100 ft. wide and accommodates all aircraft up to 160,000 lbs. dual tandem axles. The airport is an all-weather airport with multiple published IFR approaches, including GPS/LPV published approaches to all Runways. 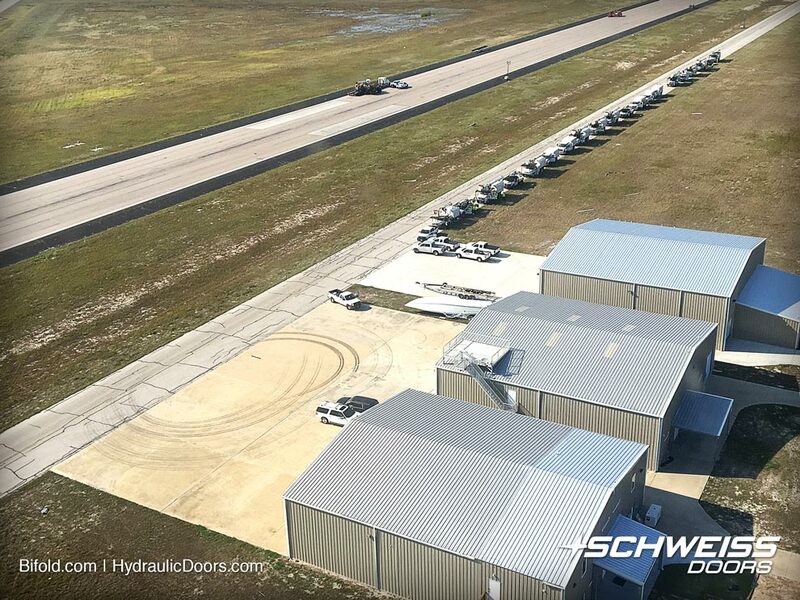 The Aransas County Airport (RKP) occupies over 600 acres, with access by paved roads on three sides and is ready for development with one of the highest elevations in the county. It is located northeast of Corpus Christi, southwest of Galveston and directly straight west of San Jose Island. The trucks visible in file along the taxiway are just a fraction of the actual number of trucks staged at the airport in the days and weeks after the storm. At one point they had over four miles worth of bucket and equipment trucks parked bumper-to-bumper. 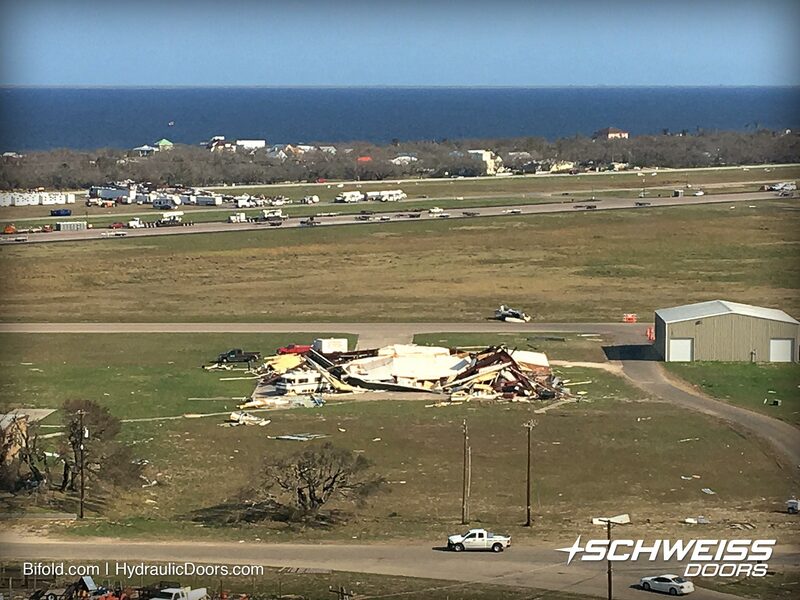 The small seaside town of Rockport, Texas, located about 30 miles northeast of Corpus Christi also received considerable damage. Harvey was the first Category 4 hurricane in the U.S. in 13 years. Geer was most amazed at how the eight Schweiss T-hangar doors came through the hurricane with just some minor cosmetic damage. They got hit hard for two hours before the eye of the hurricane came over and then for two hours more. Totaled out planes are loaded up and headed to the boneyard. Notice the airport building with the large dent at the right. 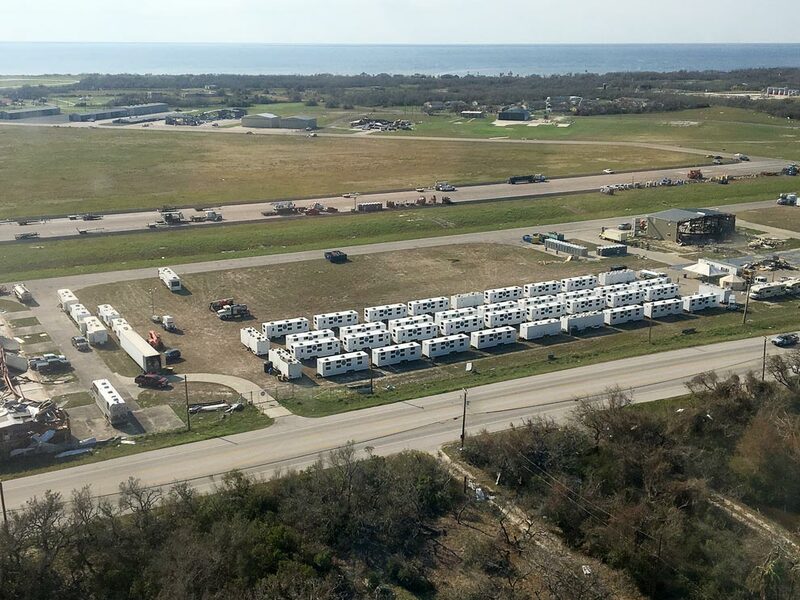 Numerous"man camp" trailers containing sleeping bunks, and bathrooms were brought in for the workers who were living at the airport for weeks after the hurricane. Two-by-fours from wooden hangars were scattered like toothpicks after being hit for 13 hours of high winds. Rockport and Fulton, Texas were directly in the path of Hurricane Harvey as it reached land. The blue area is the eye of the hurricane. 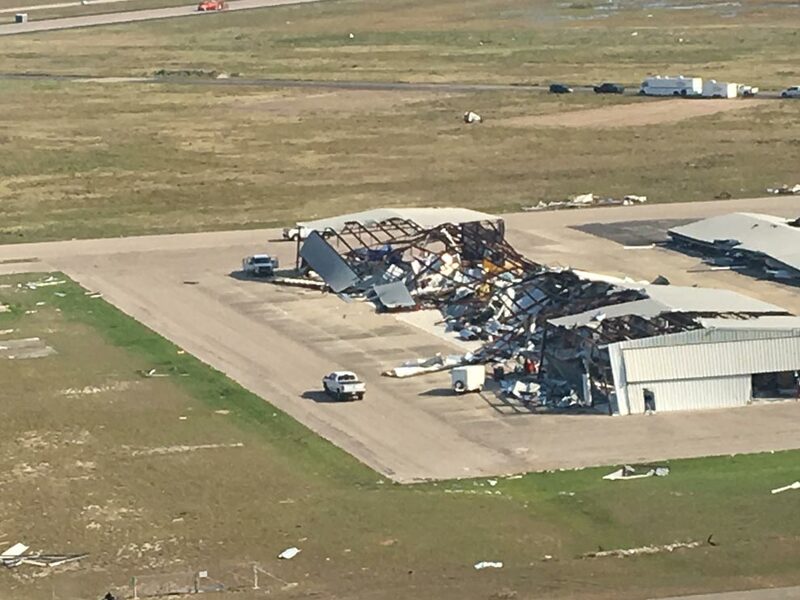 After the eye went over, the airport got blasted again by sustained 145 mph winds and 160 mph wind gusts. 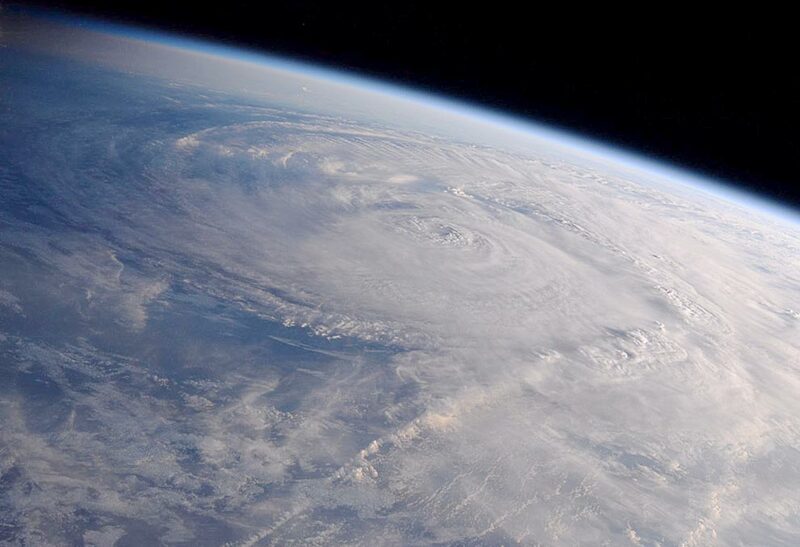 Hurricane Harvey as seen from the NASA International Space Station at 9 p.m. The eye was about 7 miles across and was moving forward at approximately 1.5 to 2 mph. This all happened during a total period of 13 hours.